MCRES – BlueTopia – Bedrock Edition is a city map made for minecraft. 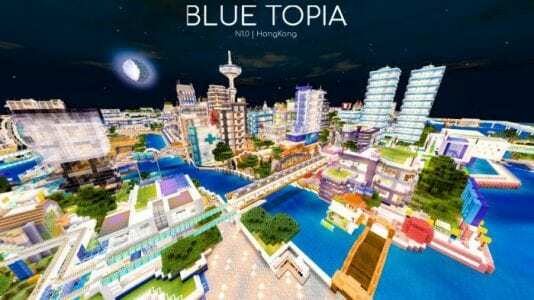 BlueTopia, also called Blue City, was a Hong Kong and New York City-based project created back in 2012 when world generation was still finite. In the ninth release (n1.2), it has been developed into a modern metropolitan with shining lights, shops, and buildings around you. With the fast & easy-to-use transit system, you can get around the world and enjoy the delight of being an MC citizen seamlessly. So another well made city map is released and I am keen to play on it. Roam and explore all you want in this replica Hong Kong style map! Umm, you stole our article, and reposted it here. Not ok. If this isn’t removed within 3 days, a DMCA takedown will be requested. You must be an idiot because the link to download is to your website so no one steals anything.